Bring unity and harmony to your life. 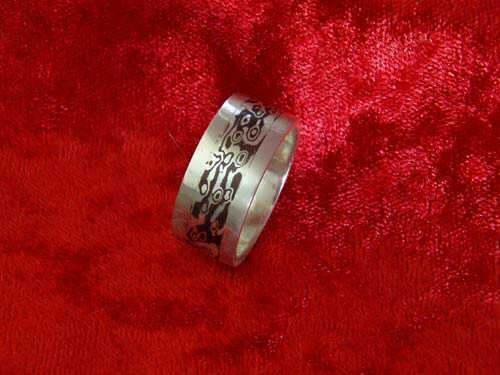 Great for wedding and engagement rings. The Mokume Gane technique was developed in 17th century Japan, following the example of the layered metal technique found in the "katana" Samurai's sword. The technique allows the forging of metal that looks actually like wood. The literal meaning of Mokume Gane is "Metal that looks like knots in wood"
The production of Mokume is a long process that requires concentration and exactness. The example that appears in the photograph is the fusion of silver and copper metals. One has to perfectly wash and polish the metal plaques in order to prevent gaps and oxidization in the heating process. The metal plaques are pressed together between two thick steel plates and then the entire apparatus is put into a high-temperature furnace. Due to the fact that the metals that are placed under extreme pressure, they heat up and eventually merge. This process is known as diffusion. This requires great concentration on the part of the artist because the most effective way to identify the moment of fusion is by observing the shades of red and orange produced by the molded hot metal. The premature arrest of the process will prevent the merging of the metals whereas the stopping the process too late will cause the melting of the metals, and therefore the destruction of the Mokume. After the billet of the Mokume is ready, the process of the creation of the textures begins. Creating indentations in the metal and rolling it out creates the effect of knots and wood grain. We must continually re-enact this process until we receive the desired texture. The use of different metals obviously creates different shades. The most common metals used in traditional Mokume are silver, copper, Shakudo (a combination of gold and copper), and Washiboishi, (a combination of silver and copper). The use of The Mokume allows me as an artist to master the production of the material itself and not just the usual process of working with prepared metals as in ordinary silver and gold crafting. Each Mokume jewel is my own exclusive and unique creation that is entirely handmade by me. The process of creating the Mokume entails "intention" a kabbalistic concept that means the concentration of consciousness. It also entails "Samadhi", a term from Yogic philosophy, meaning the ability to change and create objects on the physical plane by focusing our awareness. 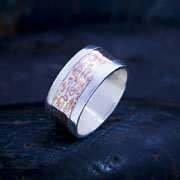 The Mokume rings are widely used as wedding rings, because of the symbolism reflected in the unification of the different metals, expressed in the merging of the two metals into one integrated texture that is simply breathtaking in its harmonious beauty.